Claudio is about to be married to Hero in the church. When asked by the Friar if anyone has any objections, he stops the proceedings. Dramatically, he gives Hero back to her father Leonato, claiming he has been tricked by her deceptive, maidenly appearances. He compares her to animals “that rage in savage sensuality,” (4.1.61) and tells everyone how he saw her with a lover on the previous night. Leonato is so shocked that he asks aloud if these accusations could possibly be true, and if he might be dreaming. Claudio replies with the rhetorical question “are our eyes our own?” (4.1.71) meaning that everything he’s said is obviously true. Don John and Don Pedro speak up in support of Claudio. Finally, Claudio accuses Hero directly. When he refuses to believe in her denial, she faints from horror. Leonato asks if anyone has a dagger for him to kill himself with. Having done what they came to do, DonPedro, DonJohn and Claudio depart. Claudio’s decision to leave Hero at the altar so dramatically underscores the theatrical nature of love in the play. Claudio compares Hero to an animal, highlighting the connection made between love and the loss of self-control. Claudio’s rhetorical question might seem like a way of saying “Obviously,” but the question he asks can also be taken seriously. The “eyes,” of the characters in Much Ado are often not their own at all: they see what other characters have tricked them into seeing. The dignity of Leonato’s old age disappears in this scene: his threat of suicide seems over-the-top, better suited to the passion of one of the younger characters. Hero revives. Leonato seems upset she is still alive, crying out that she should have died of shame. Outraged, he shouts that “she is fallen / Into a pit of ink,” (4.1.140) and that her shame has infected him. Benedick cautions him to be patient, while Beatrice is immediately certain that Hero has been slandered. Interrupting Leonato’s ranting despair, the Friar says that he believes that what has been said about Hero cannot be true. Having looked for a long time at her face, he believes that her blushing indicates innocence, not guilt. Hero herself denies what has been said about her, and Benedick suggests that Don John might have something to do with what has happened. Leonato’s “pit of ink,” comment reminds us of Dogberry’s remark that “they that touch pitch shall be defiled.” The fear of shame leads Claudio to end the wedding (for fear of becoming a cuckold), and also to Leonato’s overreaction in this scene. Fathers overreacting over their daughters are common in Shakespeare’s comedies and tragedies. In Much Ado About Nothing, very little can be taken on the basis of appearances. But the friar’s confidence that Hero is innocent suggests otherwise, that one can see the truth in others by looking deeply at them. The Friar comes up with a plan: Leonato will pretend that Hero has died, and meanwhile investigate the truth of Claudio’s accusations. If they are true, he will send her to a convent. If they are false, the marriage will be revived: the Friar guesses that Claudio will be filled with regret when he learns that his accusation killed Hero, and all the more ready to love her again when she reappears. Benedick expresses support, and Leonato agrees to the plan. Everyone leaves but Benedick and Beatrice. In the Renaissance, women who disgraced themselves or never married were often sent to convents to become nuns. The friar’s insight that Claudio will love Hero more after her “return from the dead,” suggests that love increases from overcoming obstacles. This is one of the central themes of the play. Benedick comforts Beatrice, who is weeping over what has happened to her cousin. In the course of their conversation, they confess their love for one another. When Benedick says he would do anything for her, she asks him to kill Claudio for what he has done to Hero. When Benedick refuses, she claims she will be unable to love him unless he does. She claims that, were she a man, she would do it herself, and complains that manhood no longer exists, and has been replaced with the posture of manhood. Goaded by these bitter words and his love for her, Benedick agrees to kill Claudio. Beatrice’s request marks the moment in the play when the misleading appearances start threatening to have permanent consequences on the world. Benedick’s love and Claudio’s actions are both based on tricks (one created by Don Pedro, the other by Don Jon), but here begin to threaten a real and permanent result—Claudio’s or Benedick's death. Beatrice’s complaint about the posture of manhood also ties into this theme: appearances must be proved by actions. Lucas, Julian. "Much Ado About Nothing Act 4, Scene 1." LitCharts. LitCharts LLC, 16 Sep 2013. Web. 26 Feb 2019. Lucas, Julian. 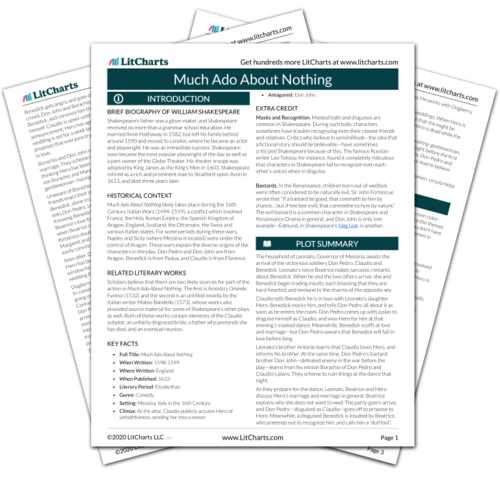 "Much Ado About Nothing Act 4, Scene 1." LitCharts LLC, September 16, 2013. 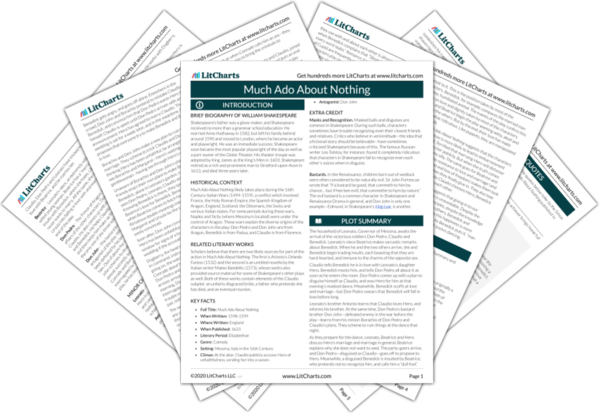 Retrieved February 26, 2019. https://www.litcharts.com/lit/much-ado-about-nothing/act-4-scene-1.